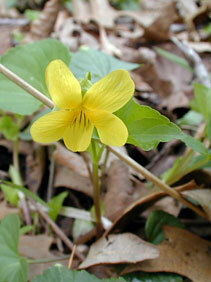 Also Called: Downy yellow violet, yellow forest-violet. Stems: Erect or decumbent, 1-several, glabrous or sparsely pubescent; stipules, prominent, leafless, on lower 1/2. Leaves: Basal leaves 0-5, long stalked, kidney-shaped to broadly egg-shaped; stem leaves 2-4, broadly heart- to egg-shaped, 1.5 to 4 inches long, up to 1/2 inch wider than long, pubescent to glabrous; margins shallow- or sharp-toothed; tips short-pointed; stalks shorter to longer than leaves, softly-hairy to glabrous; stipules broadly egg-shaped to lanceolate, 2/5 to 3/5 inch long. Inflorescences: Solitary flowers in leaf axils; stalks shorter to longer than leaves, pubescent to glabrous. Flowers: Sepals 5, 1/4 to 2/5 inch long, lanceolate to narrowly lanceolate, tips blunt or pointed, margins white, pubescent to glabrous; petals 5, 3/10 to 1/2 inch long, yellow; lower 3 with brownish-purple veins near bases; lateral 2 bearded; lowermost petal swollen on 1 side; stamens 5; small, closed, self-pollinating flowers also occur in upper axils. Fruits: Capsules, oblong-ovoid, 3/10 to 3/4 inch long, dark green to yellowish-green, conspicuously woolly to sparsely pubescent or glabrous; seeds numerous, tan to brown. Habitat: Low woodlands, thickets, and along stream banks; rarely in the open. Uses: Native Americans used an infusion made from yellow violet to treat coughs, colds, and dysentery; a poultice of leaves for headaches; and soaked corn seeds in an infusion of the roots prior to planting to ward off insects. Comments: One of the first flowers of spring.